(CBS/AP) A surveillance camera inside a Detroit, Mich., police precinct videotaped an attack by a gunman on at least four officers. The gunman walked into Detroit's Sixth precinct this past Sunday and started shooting. The video, edited by police, shows officers standing and talking behind a high desk, then gunshots are heard and the officers duck for cover. 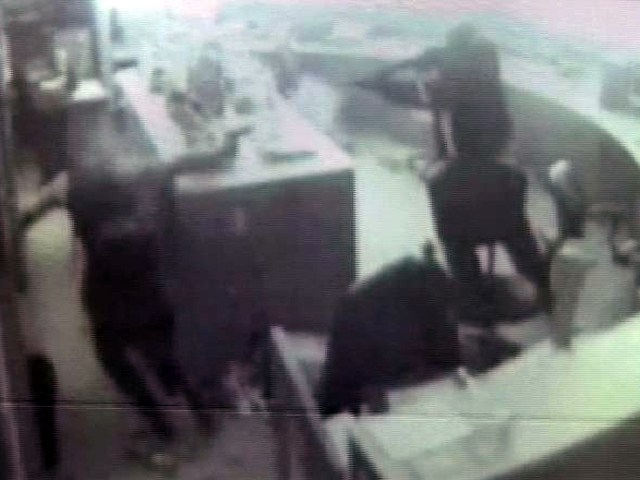 The gunman throws himself over the large desk. The video shows the gunman pointing his shotgun and firing point-blank at three officers, then the precinct's commander Brian Davis and the gunman point their guns at each other. Next, the gunman shoots Davis, who falls to the ground. The video depicts Davis falling, but throwing a garbage can toward the gunman. Four officers were wounded. None of their injuries were life-threatening. The gunman, 38-year-old Lamar Moore, was killed in the shootout.